When it comes to choosing the perfect property for you in Charleston, there are many things to consider, right? Well, with downtown property at a premium and the potential long commute associated with new construction, the area's older, closer suburbs have gained in popularity. The team at Lois Lane Properties has been extra busy off-peninsula lately, and we've a couple of stories to share! 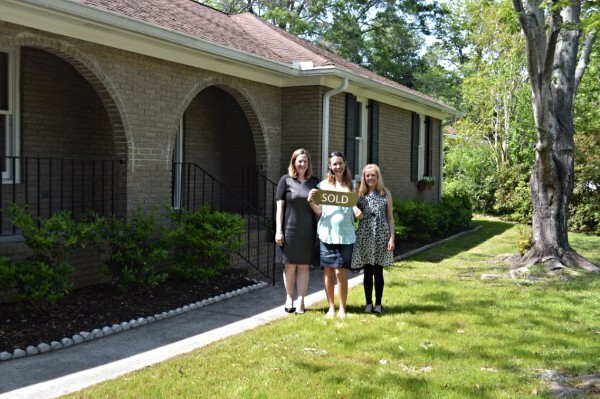 Ginger Scully (left) and Lois Lane (right) teamed up to provide Ashley Sewell with her new home at 1071 Renwood Drive. Susan Sully's Charlestowne Terrace home before (above) and now (below). Our property management guru, Ginger Scully, can pat herself on the back for her role in saving a 1979 ranch house. Her now-husband Greg Kidwell bought the abandoned James Island dwelling in December, 2013 knowing that it would have to be completely renovated but that it was worth doing. After some structural repairs, the kitchen and bathrooms were gutted and all new appliances and fixtures were added. The old carpet was ripped out and new oak hardwood flooring was installed throughout; the addition of crown moulding was a sophisticated touch. A lovely deck was added to the rear of the house, and French doors were installed to access it from both the living room and the Master bedroom. Lots of landscaping and tree work was required to whip the overgrown yard into shape, a new HVAC system was installed, and the entire house was painted inside and out. Whew! Aren't y'all tired, yet? 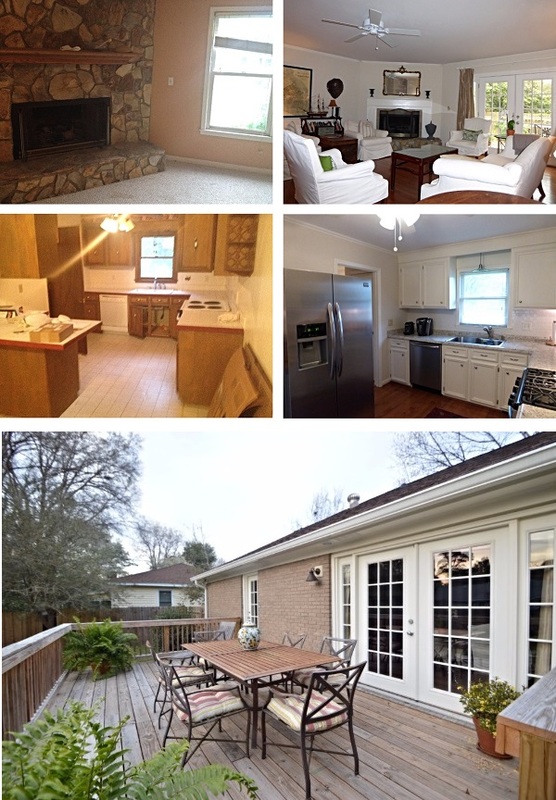 Before & after pictures of the living room and kitchen as well as the new deck at 1071 Renwood Drive. 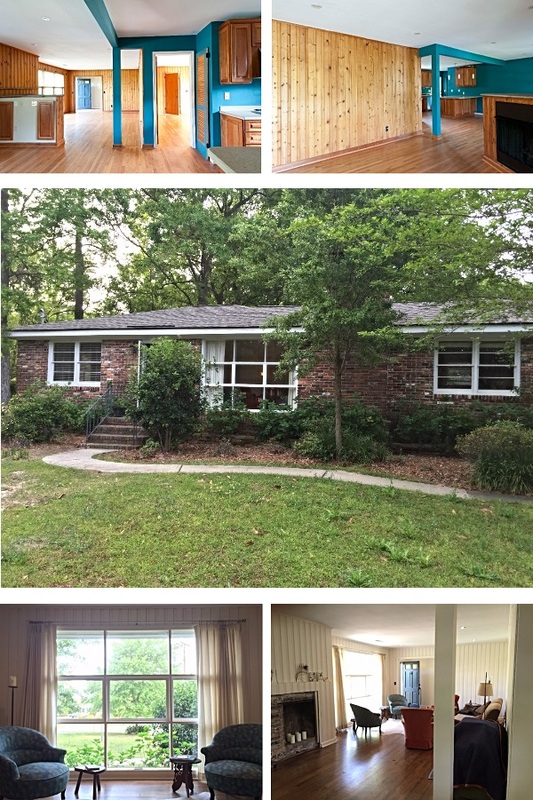 The four bedroom, three bathroom ranch house at 1071 Renwood Drive is in the Lynwood subdivision, developed in the 1960s and '70s on James Island. Some of the perks that new homeowner Ashley Sewell will enjoy are that all of the new restaurants on Folly Road as well as all of the Island's stores are within a few minute's drive. Her toddler (and number two, on the way!) will love the huge fenced-in backyard. A avid beach lover, Ashley is thrilled to be just down the road from Folly, and loves being so close to her job as a nurse downtown. Congratulations to Ashley on her new home, to Greg and Ginger on their sale, and to Lois for being able to help cobble it all together--without ever even listing the house on the market. Well done!